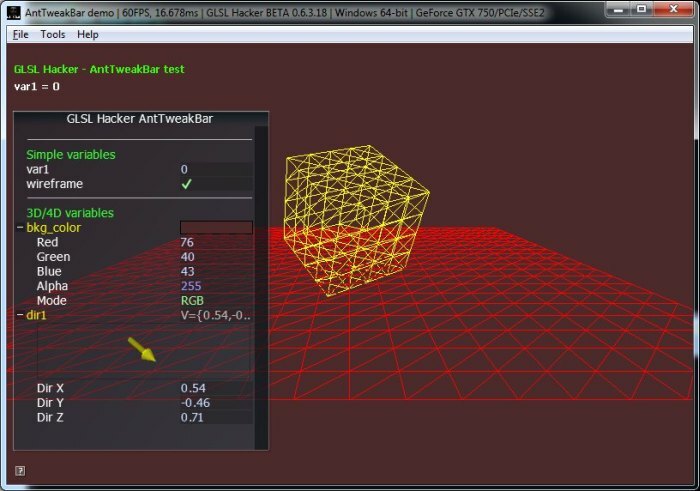 A new DEV version of GLSL Hacker is ready and can be downloaded from this page: GLSL Hacker Downloads. Due to the huge amount of changes between the official and DEV versions, I decided to remove the downloads of the official versions so now only the latest DEV versions can be downloaded. So the ATB plugin is currently limited to OSX 10.9… Thanks for the feedback! This Version does not start at all, without any errors and stuff. As normal User or with Administrator privileges under 64bit Win 7. @Jan: try to rename the plugins dir (ex: plugins_/) and start GLSL Hacker again. Maybe there is a bug with one of the plugins. Actually you can remove plugins one by one until you find the guilty. Let me know. Thanks for the tip, plugin_gxl_python_27_x64.dll was the culprit. Don’t know how to give you more Information or if its a problem in my PC’s configuration. I haven’t had time to dig deeper to know if everything works.